The US Army is under pressure from the desperate relatives of white prisoners of the Comanches to secure their rescue. A cynical and corrupt marshal, Guthrie McCabe (James Stewart), is persuaded by an army lieutenant (Richard Widmark) to assist in the negotiations with the Comanches. I think this is an underrated film from legendary director John Ford. James Stewart is great as usual, and there's a damn good supporting performance from Richard Widmark. Not Ford's best western, but still well worth checking out if for nothing else than to see Jimmy Stewart and Richard Widmark together. Their scenes carry the movie. The subject is almost a quasi-remake of The Searchers and pretty typical of Ford in his later movies, trying to humanize the Indians at least a little bit after how they'd been shown for years in Hollywood. Also worth pointing out that Two Rode Together was filmed in Bracketville, Texas, otherwise known as Alamo Village. Stewart's town is San Antonio from John Wayne's The Alamo. So as is typical with Ford movies, excellent performances from the leads Stewart and Widmark, good supporting cast of Ford regulars, great cinematography, and a story that isn't your typical AW fare. 7/10, maybe 8 on a really good day. Yeah, there is a lot of similiarities to "The Searchers." I was thinking the same thing as I watched it. That doesn't bother me all that much though, mainly because of James Stewart and Richard Widmark. I enjoyed watching their performances here. Also, I love the musical score, which makes the film all that much enjoyable. The first 15-20 mins suggest you're in for one of Ford's better movies, but the movie slowly deteriorates until it becomes too messy and preachy by the third act. Also, not enough is made of the chemistry between Stewart and Widmark, they rarely are on screen together in the last half. I'd give this a generous 7 just because of the river scene, the two leads and Ford. How are you guys seeing this? It doesn't seem to be on DVD. I've wanted to see it for ages. It was on TCM not too long ago. This underseen oater is probably John Ford's most cynical Western. Coming in the midst of Ford's late-career revisionist period - right in between Sergeant Rutledge and The Man Who Shot Liberty Valance - Two Rode Together (1961) is a flawed but intriguing film that throws the moral ambiguity of frontier warfare into stark relief. 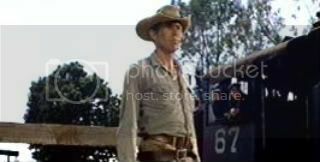 Guthrie McCabe (James Stewart) is the crooked Marshal of Tuscosa, Texas, who is dragooned by friend Cavalry Lieutenant Gary (Richard Widmark) into joining him. A group of settlers has lost family members to Quanah Parker's (Henry Brandon) band of Comanches, and McCabe and Gary are assigned to bring the captives back. They are successful, bartering the release of teenaged boy Running Wolf (David Kent) and Mexican woman Elena (Linda Darnel), wife of warrior Stone Calf (Woody Strode), but the situation is complicated by the fact that two are not quite willing to return to civilization. While the half-crazed Mrs. McCandless (Jeanette Nolan) desperately believes Running Wolf is her son, Elena falls for Guthrie, but finds herself outcast by the racist settlers. Two Rode Together borrows many plot elements and set-pieces from Ford's The Searchers (1956), but is even more bitter and cynical. The Searchers left one major question unanswered in its rush for a pseudo-happy ending: Natalie Wood's Debbie initially refused to leave the Comanche, only to apparently change her mind. The question of whether she wanted to return, so intriguingly raised earlier in the film, is dropped. Here, Ford and writer Frank Nugent confront the issue head-on, and despite several patches of broad comedy, it's certainly Ford's darkest Western. Historically, white captives taken by Indians often didn't want to return to civilization, preferring to stay with their adopted families. Both Elena and Running Wolf are highly reluctant to rejoin white society; whether Running Wolf is even white is unclear until the tragic denouement. This isn't even the most troubling issue raised: One settler (Willis Bouchey) tells McCabe it doesn't matter if the child he's "rescuing" is his own, so long as he can shut up his wife, and the McCandlesses adopt Running Wolf out of misguided desperation. Even when Elena tries to join society, she's treated as an outcast by whites who see her as "ruined" by sleeping with a Comanche buck. Compared to the ambivalence of The Searchers and the garbled Cheyenne Autumn (1964), Ford provides a remarkably stark and negative view of frontier race relations. The film is surprising in other areas too. Guthrie McCabe is an amusingly amoral protagonist. He's introduced copying Henry Fonda's rocking chair bit from My Darling Clementine, but he's also lazily sipping beer as his deputy (Chet Douglas) rounds up prisoners. Throughout the film he's presented as a completely amoral capitalist: "What's the price of a human life?" "Whatever the market will bear!" He negotiates a take from all Tuscosa's businesses, tries to fleece the settlers for his services, sells guns to the Comanche in exchange for captives, and tricks Stone Calf into a one-sided showdown. James Stewart makes McCabe charming and funny, but he's also an irredeemable dirtbag, and Ford gives him the perfect comeuppance in the finale. Ford actively subverts his previous films in other ways. While previous Ford Westerns depicted the West as a "garden" where civilization is being cultivated, Two Rode Together shows Tuscosa - the product of such toil - a contemptible backwater, polished in appearance but ruled by the crooked Marshal and feisty saloon-owner Belle (Annelle Hayes). The earnest settlers, the backbone of most Ford flicks, are simply more rubes for McCabe to take advantage of, and the Cavalry Major (John McIntire) is as corruptible as McCabe. Even the usual set-pieces are subverted: while a slapstick brawl isn't out of place, the community dance is here used to highlight the settlers's racism. Few characters come off well here, and Ford makes us wonder if the pioneers's hard work was worth it. Ford's direction is unremarkable by his usual standards; he reportedly had little interest in the film and it shows with its fairly pedestrian visual scheme. The movie has a slow, langorous pace and it takes a long time for the plot to get going; Ford allows long, lingering dialogue scenes, particularly McCabe and Gary's wonderfully frank, seemingly ad-libbled river-side discussion, a true gem. The film often veers towards comedy - though certainly less obnoxious than in most other Ford flicks - but even in its lighter moments the cynicism bleeds through. Nugent's script is near-perfect, and George Duning provides a fine score. James Stewart is wonderfuly cast against-type: his Guthrie McCabe is not psychotic like several of his Anthony Mann protagonists, but his complete amorality is a refreshing change of pace. Richard Widmark is fine as the conflicted cavalry officer - a role he'd reprise in Cheyenne Autumn - and has a perfect rapport with Stewart. Shirley Jones and the luminous Linda Darnell (The Alamo) get well-rounded characters to play, and Annelle Hayes and John McIntire (Winchester '73) have meaty supporting roles. The usual John Ford regulars are onhand: Andy Divine, John Qualen, Ken Curtis, Harry and Olive Carey, Henry Brandon, Woody Strode, Anna Lee, Willis Bouchey, Jeanette Nolan and Jack Pennick all put in appearances. If Two Rode Together is far from John Ford's best work, it's certainly far better than its dismal reputation suggests. so what's the deal with this movie? any way to see it in America? It's not available on Region 1 dvd, and it's not streaming on iTunes or Netflix. Anyone know anything about any American release? Beats me. I watched it on TCM. That is where I also saw it. Just looked it up on TCM - it's selling for 50 dollars. I'm definitely not gonna spend that for this set... and unfortunately, Netflix never gets these Columbia/TCM sets... But I've actually borrowed some of the Columbia/TCM noir sets from the Brooklyn Public Library; so hopefully, they'll get this one sometime. I hope this BRD will be available as a single movie, and not as part of a multi-movie set?